University of Texas Press, 9780292761933, 235pp. Many language books are boring--this one is not. Written by a native English speaker who learned Spanish the hard way--by trying to talk to Spanish-speaking people--it offers English speakers who have a basic knowledge of Spanish hundreds of tips for using the language more fluently and colloquially, with fewer obvious "gringo" errors. Writing with humor, common sense, and a minimum of jargon, Joseph J. Keenan covers everything from pronunciation, verb usage, and common grammatical mistakes to the subtleties of addressing other people, "trickster" words that look alike in both languages, inadvertent obscenities, and intentional swearing. 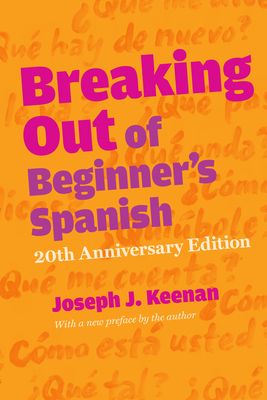 He guides readers through the set phrases and idiomatic expressions that pepper the native speaker's conversation and provides a valuable introduction to the most widely used Spanish slang. With this book, both students in school and adult learners who never want to see another classroom can rapidly improve their speaking ability. Breaking Out of Beginner's Spanish will be an essential aid in passing the supreme language test--communicating fluently with native speakers.